Cats go crazy every time their human masters use laser pointers to play with them. We have yet to meet a kitty whose curiosity was not aroused and its predatory instincts not awakened by that small red dot which can mimic a really agile prey. And if you’re like most pet parents who would want to give their kitties the much-needed workout instead of just lazing in its cat bed, then you should also start looking for the best laser pointer for your tabby. Don’t worry. 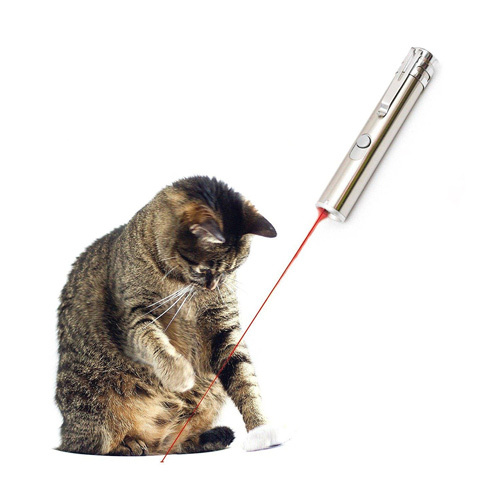 We’ve got you covered with our list of the 7 best laser pointers for cats. One of the best things about the iGearPro Chase Cat Toy Interactive LED Light is that it has three different functions all built into an elegant and stylish chamber, made even more exquisite by the use of premium-quality stainless steel. While some brands are known to integrate a mini flashlight to go with their laser pointer functionality, iGearPro is one of the few that managed to include ultraviolet light functionality in its nifty design. This is the same kind of light used by professionals in spotting counterfeit currency or even to identify ‘invisible’ stains on floors, walls, ceilings, and other surfaces. Of course, since we’re talking about laser pointers for cats, the laser emitted by the device is guaranteed to be safe for your kitty and other pets. It may be priced higher than most, but many pet parents will agree, it’s well worth it. 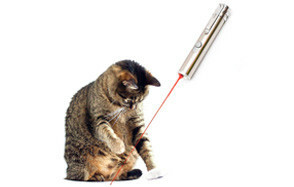 Laser pointers are very fun to use to give your cat its much-needed exercise. 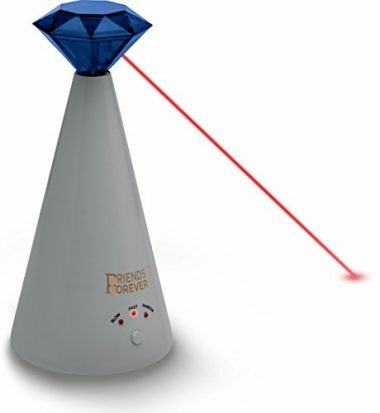 Unfortunately, if you’re super-busy, then you’d need the Friends Forever Interactive Laser Toy for Pet Cat. 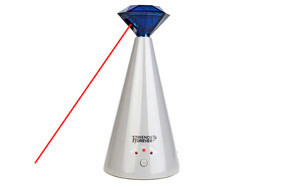 Standing some 8.25 inches, this conical device with a blue diamond-shaped laser emitter on top will take the place of your hands by projecting 3 different laser modes to keep your cat busy and entertained. You can set it to slow or fast or even to project random light patterns for your kitty to pounce on. You even don’t need to worry about shutting it off since it does so by itself after 15 minutes of use. Our only concern is that if your kitty is the rather rambunctious kind, then there is a tendency to knock the device over. Thankfully, it’s stable enough because of its wide-base conical design. For just a little over $5 you’re already going to get 2 laser pointers from Innozon. These Laser Pointer Chaser Toys for Cats come with dual functionality: laser light and flashlight. It’s compact and can easily slip inside your pocket. There’s also no need to keep on pressing the light button since the Innozon comes with a 2-position sliding switch, one each for the two different modes. The stainless steel casing is a marvel to behold, too, and such a joy to hold on one’s hand. The lanyard should come in handy as well. If you’re looking for something whimsical, something that no kid will ever mistake for something else other than a nifty toy for your kitty in the house, then cmbb’s Cat Catch the Interactive Light Pointer is a must. 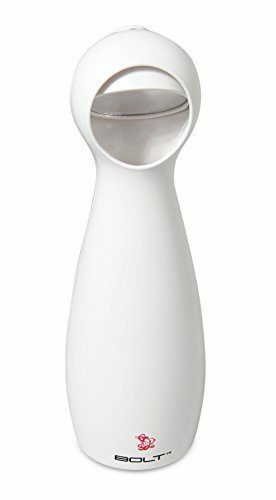 Shaped like the leg and paw of a cat, the Cat Catch comes with 5 buttons that are shaped like the paw pads of your kitty. The operation is pretty straightforward, too. A single press of any button activates the light flashing mode. Press any other button and you turn the flashing light into a steady beam. Press any button again and it turns off the device. The use of ABS plastic and silicone is quite thoughtful, too, considering its price. 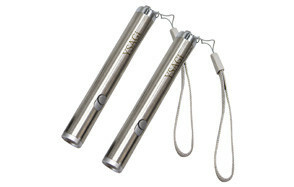 The YSAGi Funny Pet Cat Catch Interactive Light Toy shares many similarities with the Innozon laser pointer for cats. 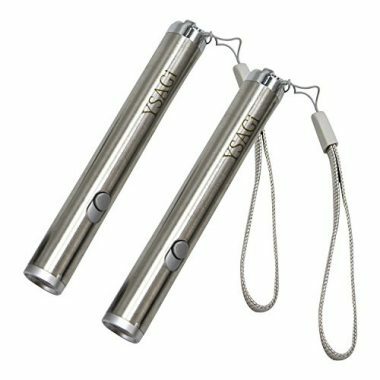 From the stainless steel casing to the 2-position sliding switch mechanism to the dual functionality of the laser pointer, the YSAGi and the Innozon are like twins. There’s also a lanyard for ease of carry. So is there any difference? Well, YSAGi is shorter by 0.1 inch and is more expensive by a few dollars if you don’t consider its discounted price. Based on consumer reviews, there’s this tendency to gravitate towards YSAGi suggesting that there could be some feature that is not clearly evident during a single evaluation. 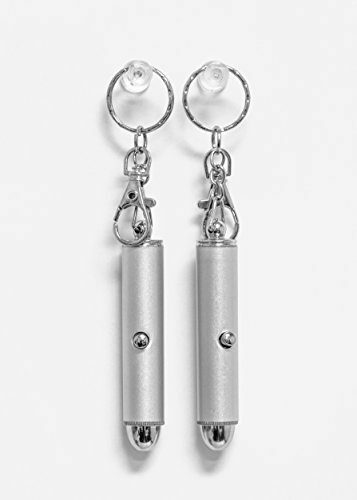 Measuring a mere 3 inches long, the Animmo Cat Light Pointers are a great option if you want something that you can easily attach to your existing keychain since it already comes with its own key-ring and clip attachment. Made of durable aluminum, the Animmo is a neat-looking laser pointer that gets the job done without having to press the button while playing with the light. It does require A76-type batteries so you’d better stock up on these, although Animmo is giving you 2 sets each for the 2 laser pointers. 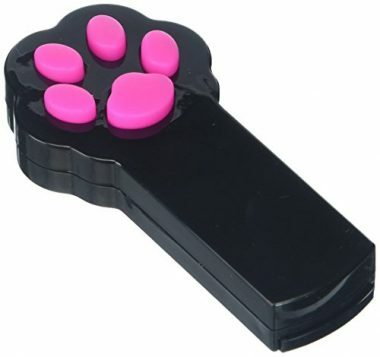 The Bolt Interactive Laser Cat Toy from PetSafe is a fully-automated laser pointer that automatically turns itself off after 15 minutes of laser play. You can look at the Bolt as an inexpensive alternative to the Friends Forever Interactive Laser Toy for Pet Cat. Unfortunately, there are some serious issues with the new design. Aside from the risk of getting toppled over because of a rather narrow base, the new Bolt comes with a highly unreliable motor that creates weird noises plus laser light patterns that are easily lost within 2 feet. Also, the randomness of the laser patterns, as some pet parents commented, is not really random at all. This made their cats to lose interest in the device. On the bright side, the laser itself is safe for pets and a fully adjustable mirror for aiming the laser light. 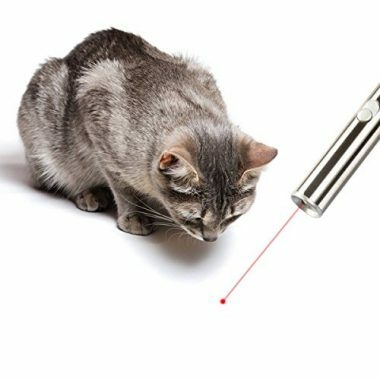 While the cat-loving community is actually divided whether or not laser pointers can truly be beneficial for cats, one cannot argue the fact that kitties love chasing and pouncing on the red dot emitted by these nifty gadgets. But you have to be careful since not all laser pointers are safe for your kitty. Don’t know what we’re talking about? Well, read on so you’ll be more empowered on how to choose the right laser pointer for your pet cat. Why Do Cats Like Laser Pointers So Much? Cats don’t really like laser pointers per se; they only ‘look’ like they love the light emitted by the gadget because it stimulates their very instinct – that of being a predator. In the wild, cats have to be very vigilant. Even large cats like lions, tigers, and cougars have to be very cautious and very observant of their surroundings because they can also be the prey at any given moment. If you try to look at how your cat behaves while it is playing with the laser light, it assumes the characteristic predator stance – eyes focused on the target, front body slightly lower than the back, and its hind legs slightly bent ready to spring into action. It doesn’t try to ‘catch’ the light immediately. In its brain, it is trying to make highly-accurate calculations as to the pattern of the ‘prey’ and where it will move next. Assuming you don’t create a very predictable pattern in your laser light movements, your cat will glue its sights on the moving red dot. Move the light slowly or in a very predictable pattern and your cat will readily ‘pounce’ on the red dot. You see, cats don’t love the red dot. Their natural predatory instincts are simply stimulated so they will try to ‘catch’ the prey by calculating where it will be next. Cats, like all pets, require plenty of play time for a variety of reasons. Here are some of the more important ones. This is perhaps the most important reason why you need to play with your pet cat. Kitties, regardless of size, have very strong predatory instincts. Anything that moves is typically interpreted by their brains as prey. It is their raison’d’etat, their true essence for being cats. If you don’t nurture their predatory instincts, you’re not contributing to their development as felines. Cats, like dogs and other pets, don’t need a very strict exercise regimen. As long as they can run, jump, stretch, and move their limbs in different positions, you are actually giving them the opportunity to exercise. This will help lead to healthier tabbies, lower the risk of obesity and its associated complications, and improve your cat’s overall quality of life. Play time is physically and mentally stimulating for your cat. Being able to act out their predatory instincts require focus and concentration. While it is not readily apparent, your kitty will be very busy trying to ‘pounce’ on its prey. The mere fact that it is using its brain to try to ‘catch’ its prey means it is not getting bored. Playing with your pet shows that you care for it. While cats are not really that very social compared to dogs, they do appreciate the time you spend playing with them. Your relationship with your pet is nurtured and strengthened, allowing for healthier and better-rounded kitty. Like all pet toys, laser pointers have to be used in the right way so that we don’t bring harm to our kitties. When we say harm, we don’t necessarily mean physical injuries. As you will see later on in this article, there are certain issues that we have to address whenever we play with our cats using a laser pointer. What should suffice at this point is that we know how to use a cat laser toy the right way. Here are some tips. The laser pointer should not be your cat’s one and only toy. It should never be used more than 10 to 15 minutes at a time, otherwise you risk forming behavioral problems in your kitty (more on that later). Make sure that you also have other cat toys with you. Scatter other toys in your play area. You can even whip up some treat in one area. Point the laser light on a toy or even on the kitty treat and let the red dot stay there until your kitty ‘pounces’ on the red dot and ‘grabs’ the toy or the food instead. This helps complete the ‘hunt’ where your kitty was able to pounce on the ‘prey’. Make sure to never point the laser light directly into your kitty’s eyes. While the laser light may not bring damage to the eyes if you accidentally shine in on your cat’s eyes for a split second, prolonging the exposure can bring some serious damage. Can a Laser Pointer Harm My Kitty’s Eyes? We mentioned above that laser light, if shone very briefly (split-second) into the eye of your cat will not bring any serious damage to its eyes. However, you have to understand that not all products are created to adhere to the safety specifications for laser pointers. Typically, safe laser pointers should have a power output of between 1 and 5 milliwatts (mW). The lower the number the safer it should be. Lasers generate heat and can seriously damage tissues especially the sensitive rods and cones of the eyes. If the product produces more than 5 mW, then even a split-second exposure can injure your cat’s eyes. That is why it is important to choose only those products that clearly specify their power output or are at least labeled as pet-safe. Laser pointers do not only have the potential to cause injuries to your cat’s eyes. It also has the potential to cause a variety of behavioral problems. Think of it this way. 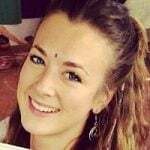 You are being given a very rare opportunity to ‘win’ something or to be ‘rewarded’ with something. But no matter how hard you try, regardless of how precise you are in your plans, you simply cannot get the ‘prize’ even if it seems you already got it. How will you feel? What will you do? Most folks will feel very frustrated, like they are being cheated. They will vent their frustrations on something else. They can get very violent or perhaps even go into severe depression. The point is that because the action did not result into any form of tangible ‘reward’, behavioral or even psychological problems can arise. This is what happens to your cat. True, it may be having a fun time trying to catch the light. But even if it already manages to ‘pounce’ on the red dot, it still is not able to ‘grab hold’ of the ‘prey’. In other words, your cat is hunting for prey that it can never catch. Do you know how frustrating this is? As such, your cat has the tendency to display behavioral problems. It can start scratching on your furniture, carpet, bedding, and even toys. It can tear apart other things just so it can release all that frustration inside it. This is why experts caution the use of laser pointers; not so much because of the dangers to the eyes but rather the risks involved in the psychology and behavior of your cat. This is also the reason why one of the best methods for using a laser pointer is to shine it on your cat’s favorite toy so that when your kitty pounces on the red dot it is able to ‘grab’ and hold onto the ‘prey’. This is its reward for hunting. And this is the key to making laser light play with cats safer and truly more beneficial. Laser pointers are great toys for cats. Just make sure you know how to use it properly so you can avoid injuring your pet’s eyes and developing behavioral problems in your cat. With these 7 best laser pointers for cats plus the guide we made for you, we’re hopeful you can make the right decision to purchase only the best and the safest for your kitty.